StemSpan™ CC100 (100X) contains a combination of both early- and late-acting recombinant human (rh) cytokines (Flt3L, SCF, IL-3 and IL-6) formulated to support the proliferation of human hematopoietic cells. 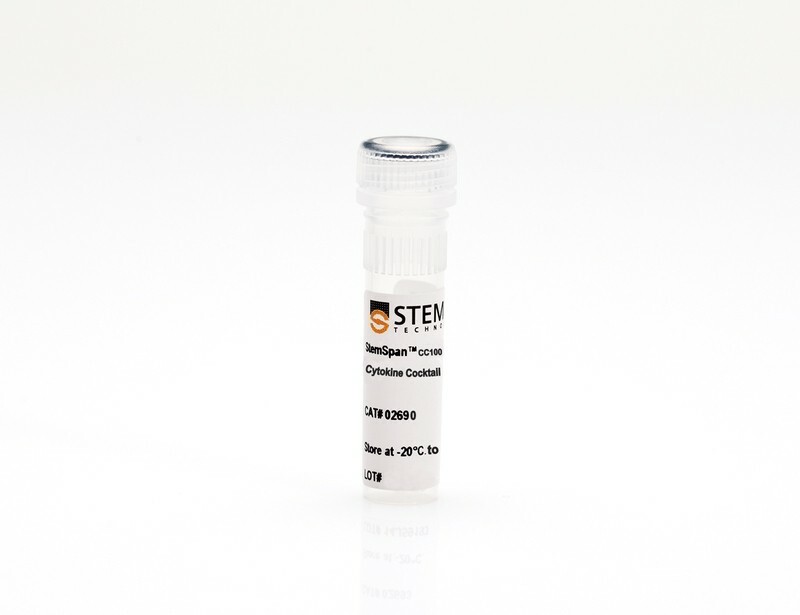 CC100 is intended for use in combination with StemSpan™ SFEM, SFEM II, H3000 or -ACF serum-free expansion media. 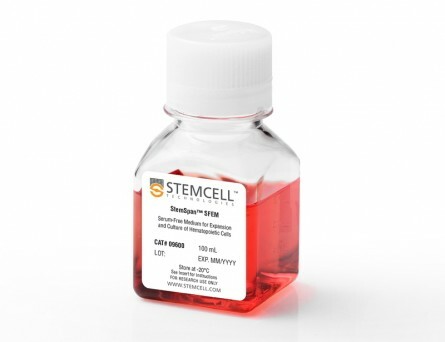 When added to serum-free medium, CC100 promotes the expansion of CD34+ cells isolated from human cord blood and bone marrow and is recommended if high cell yields and large numbers of CD34+ cells are desired. See data tab for more details. 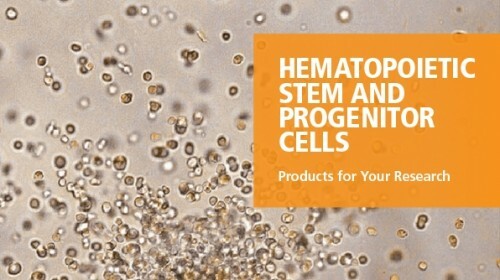 Purified CD34 + human cord blood (CB) cells were suspended at a concentration of 10,000 per mL in StemSpan™ SFEM (dark gray bars), SFEM II (gold bars) and ACF (orange bars) media containing CC100 Cytokine Cocktail (Catalog #02690). Cultures were maintained for 7 days, after which the cells were counted and examined for CD34 and CD45 expression by flow cytometry. Shown are the fold expansion of total nucleated cells (TNC) (A) and CD34 + cells (B) per input CD34 + cell, and the percent CD34 + cells (C). Results represent the average of 32 different CB samples. Vertical lines indicate 95% confidence limits, the range within which 95% of results fall. 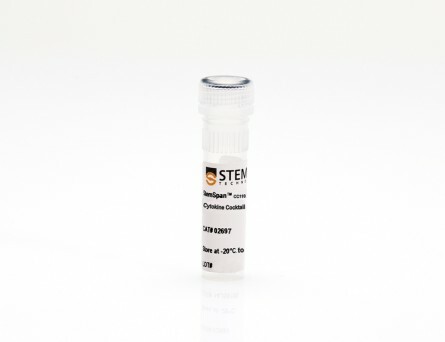 The numbers of cells produced in StemSpan™ SFEM II were significantly higher than in StemSpan™ SFEM and StemSpan™-ACF (*P<0.001, paired t-test, n=32). Expansion of CD34 + cells, normalized relative to the values obtained in StemSpan™ SFEM medium (dark gray bars) after culturing purified CD34 + CB (A, n=6) or bone marrow (BM) (B, n=3) cells for 7 days in StemSpan™ SFEM, SFEM II (gold bars) and ACF (orange bars), and six media from other commercial suppliers (light gray bars, Competitor 1-6, which included, in random order, StemPro34 (Life Technologies), X-Vivo-15 and HPGM (both from Lonza), SCGM (Cellgenix), StemLine II (Sigma) and HP01 (Macopharma)). 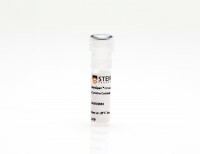 All media were supplemented with StemSpan™ CC100 Cytokine Cocktail (Catalog #02690). Vertical lines indicate 95% confidence limits, the range within which 95% of results fall. 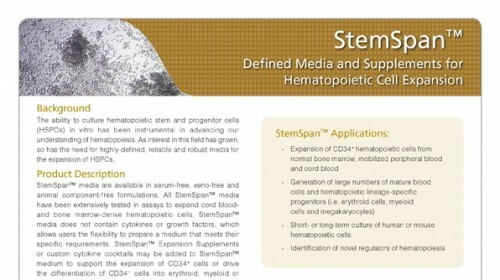 The numbers of CB and BM cells produced in StemSpan™ SFEM II were significantly higher than in all other media, except the numbers of CB cells produced in StemSpan™-ACF (*p<0.05, paired t-test). A simple, cost-effective but highly efficient system for deriving ventricular cardiomyocytes from human pluripotent stem cells. 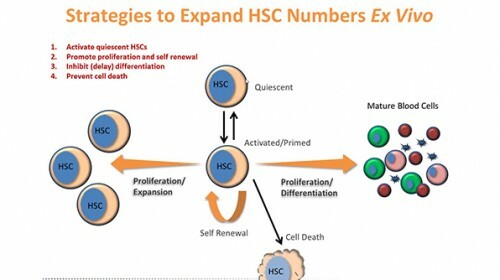 Self-renewable human pluripotent stem cells (hPSCs) serve as a potential unlimited ex vivo source of human cardiomyocytes (CMs) for cell-based disease modeling and therapies. Although recent advances in directed differentiation protocols have enabled more efficient derivation of hPSC-derived CMs with an efficiency of ∼50&percnt;-80&percnt; CMs and a final yield of ∼1-20 CMs per starting undifferentiated hPSC, these protocols are often not readily transferrable across lines without first optimizing multiple parameters. Further, the resultant populations are undefined for chamber specificity or heterogeneous containing mixtures of atrial, ventricular (V), and pacemaker derivatives. 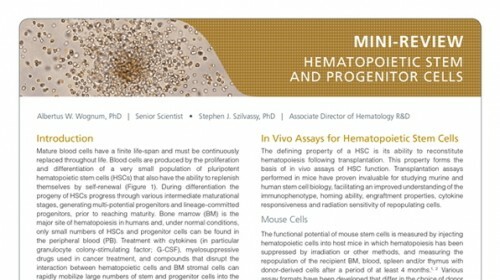 Here we report a highly cost-effective and reproducibly efficient system for deriving hPSC-ventricular cardiomyocytes (VCMs) from all five human embryonic stem cell (HES2, H7, and H9) and human induced PSC (hiPSC) (reprogrammed from human adult peripheral blood CD34(+) cells using nonintegrating episomal vectors) lines tested. Cardiogenic embryoid bodies could be formed by the sequential addition of BMP4, Rho kinase inhibitor, activin-A, and IWR-1. Spontaneously contracting clusters appeared as early as day 8. At day 16, up to 95&percnt; of cells were cTnT(+). Of which, 93&percnt;, 94&percnt;, 100&percnt;, 92&percnt;, and 92&percnt; of cardiac derivatives from HES2, H7, H9, and two iPSC lines, respectively, were VCMs as gauged by signature ventricular action potential and ionic currents (INa(+)/ICa,L(+)/IKr(+)/IKATP(+)); Ca(2+) transients showed positive chronotropic responses to &dollar;\&dollar;-adrenergic stimulation. Our simple, cost-effective protocol required the least amounts of reagents and time compared with others. While the purity and percentage of PSC-VCMs were comparable to a recently published protocol, the present yield and efficiency with a final output of up to 70 hPSC-VCMs per hPSC was up to 5-fold higher and without the need of performing line-specific optimization. These differences were discussed. 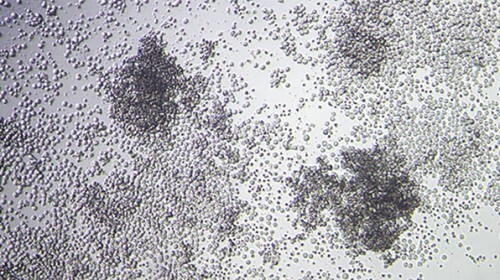 The results may lead to mass production of hPSC-VCMs in bioreactors. Recombinant erythroid Kruppel-like factor fused to GATA1 up-regulates delta- and gamma-globin expression in erythroid cells. The β-hemoglobinopathies sickle cell disease and β-thalassemia are among the most common human genetic disorders worldwide. Hemoglobin A2 (HbA2, α₂δ₂) and fetal hemoglobin (HbF, α₂γ₂) both inhibit the polymerization of hemoglobin S, which results in erythrocyte sickling. Expression of erythroid Kruppel-like factor (EKLF) and GATA1 is critical for transitioning hemoglobin from HbF to hemoglobin A (HbA, α₂β₂) and HbA2. The lower levels of δ-globin expression compared with β-globin expression seen in adulthood are likely due to the absence of an EKLF-binding motif in the δ-globin proximal promoter. In an effort to up-regulate δ-globin to increase HbA2 expression, we created a series of EKLF-GATA1 fusion constructs composed of the transactivation domain of EKLF and the DNA-binding domain of GATA1, and then tested their effects on hemoglobin expression. EKLF-GATA1 fusion proteins activated δ-, γ-, and β-globin promoters in K562 cells, and significantly up-regulated δ- and γ-globin RNA transcript and protein expression in K562 and/or CD34(+) cells. The binding of EKLF-GATA1 fusion proteins at the GATA1 consensus site in the δ-globin promoter was confirmed by chromatin immunoprecipitation assay. Our studies demonstrate that EKLF-GATA1 fusion proteins can enhance δ-globin expression through interaction with the δ-globin promoter, and may represent a new genetic therapeutic approach to β-hemoglobinopathies. Overexpression of IL-3Rα on CD34+CD38- stem cells defines leukemia-initiating cells in Fanconi anemia AML. Expression of the transcriptional repressor Gfi-1 is regulated by C/EBPalpha and is involved in its proliferation and colony formation-inhibitory effects in p210BCR/ABL-expressing cells. Ectopic expression of CAAT/enhancer binding protein α (C/EBPα) in p210BCR/ABL-expressing cells induces granulocytic differentiation, inhibits proliferation, and suppresses leukemogenesis. To dissect the molecular mechanisms underlying these biological effects, C/EBPα-regulated genes were identified by microarray analysis in 32D-p210BCR/ABL cells. One of the genes whose expression was activated by C/EBPα in a DNA binding-dependent manner in BCR/ABL-expressing cells is the transcriptional repressor Gfi-1. We show here that C/EBPα interacts with a functional C/EBP binding site in the Gfi-1 5'-flanking region and enhances the promoter activity of Gfi-1. Moreover, in K562 cells, RNA interference-mediated downregulation of Gfi-1 expression partially rescued the proliferation-inhibitory but not the differentiation-inducing effect of C/EBPα. Ectopic expression of wild-type Gfi-1, but not of a transcriptional repressor mutant (Gfi-1P2A), inhibited proliferation and markedly suppressed colony formation but did not induce granulocytic differentiation of BCR/ABL-expressing cells. By contrast, Gfi-1 short hairpin RNA-tranduced CD34(+) chronic myeloid leukemia cells were markedly more clonogenic than the scramble-transduced counterpart. Together, these studies indicate that Gfi-1 is a direct target of C/EBPα required for its proliferation and survival-inhibitory effects in BCR/ABL-expressing cells. Absence of functional EpoR expression in human tumor cell lines. Certain oncology trials showed worse clinical outcomes in the erythropoiesis-stimulating agent (ESA) arm. A potential explanation was that ESA-activated erythropoietin (Epo) receptors (EpoRs) promoted tumor cell growth. Although there were supportive data from preclinical studies, those findings often used invalidated reagents and methodologies and were in conflict with other studies. Here, we further investigate the expression and function of EpoR in tumor cell lines. EpoR mRNA levels in 209 human cell lines representing 16 tumor types were low compared with ESA-responsive positive controls. EpoR protein production was evaluated in a subset of 66 cell lines using a novel anti-EpoR antibody. EpoR(+) control cells had an estimated 10 000 to 100 000 EpoR dimers/cell. In contrast, 54 of 61 lines had EpoR protein levels lower than 100 dimers/cell. Cell lines with the highest EpoR protein levels (400-3200 dimers/cell) were studied further, and, although one line, NCI-H661, bound detectable levels of [(125)I]-recombinant human Epo (rHuEpo), none showed evidence of ESA-induced EpoR activation. There was no increased phosphorylation of STAT5, AKT, ERK, or S6RP with rHuEpo. 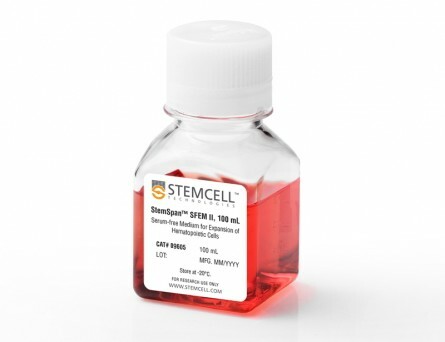 In addition, EpoR knockdown with siRNAs did not affect viability in 2 cell lines previously reported to express functional EpoR (A2780 and SK-OV-3). These results conflict with the hypothesis that EpoR is functionally expressed in tumors.